We’re always working to improve our solutions for all our partners, and today I’m very excited to share with you a new service that we’re launching on our dashboard. We’re introducing Link Notifications, a service that notifies each of our agency partners whenever a new link is acquired on your campaign. This new feature shows you exactly what kind of high quality work we’re doing on your campaigns, and makes it easier to track the great content that we’re publishing on high-authority sites. When you log into the reseller dashboard and navigate to My Campaigns, you will see the Links tab, which was also a recent addition to your dashboard. The Links tab contains a list of all links we’ve built for your campaign, arranged from the most recent to the oldest link. 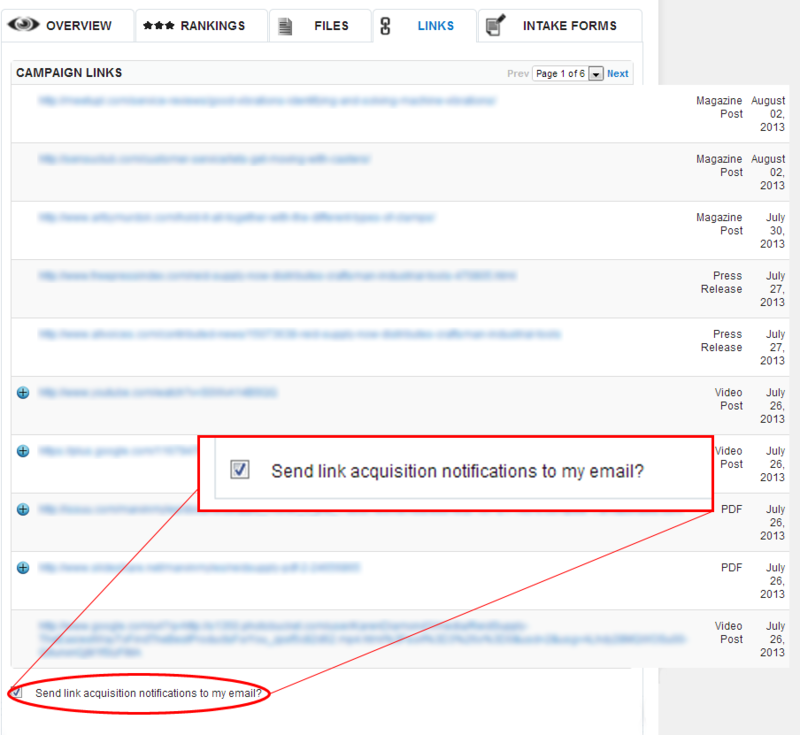 Below this table is a checkbox that shows your activation of link acquisition notifications. We will be activating this feature for all our partners automatically. You will start receiving system-generated messages informing you that new links have been acquired. You can click on the links from the email message to read the feature posted. Every time we acquire a new link for you, you will receive an email informing you of the work we’ve done. You can turn your link notifications off at any time. Just tick the box with the “Send link acquisition notifications to my email?” text at the bottom of the Links tab on your dashboard to turn it on or off, or you can click the link on your email if you want to turn off the notifications. You can still view a complete list of the links we’ve built for your campaigns on your reseller dashboard. Log in to your dashboard right now to check out this new feature, or talk to your account manager today if you have any questions about our new service. We’d be glad to explain it further to you. Make sure to check out our full line-up of solutions as well. If you’re not yet our partner, sign up for free today and enjoy the benefits of our SEO reseller program. Keep checking back for more updates!